Searching the web even in 1999 one would hardly find the term original old style Morgan horse or old style Morgan horse or original old type Morgan horse or old type Morgan horse in a search engine or meta tag. Modern Morgan breeders were ashamed of the old type Morgan and their working roots. They chose to breed more to the Standardbred or Arab show type. Today there are many meta tags with old type or old style Morgan. But, a pedigree doesn't make a horse like the original. So, have the numbers of the old type Morgan increased that much in such a short time? No. So why so many search engine meta tags advertising old type or old style Morgan? Because, people want them now. 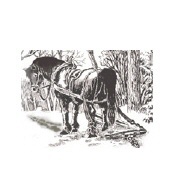 Question 1: What organization has the most Morgan horses by pedigree? Answer 1: The American Morgan Horse Association. Question 2: What Organization exists to breed and "improve" (including color) the old style Morgan horse by pedigree with the fewest out crosses for the different purposes of its members? Answer 2: The Lippitt Club. Question 3: What organization breeds exclusively old style Morgans (of only traditional color) to preserve by pedigree limited to the fewest out crosses for the different purposes of its members? Answer 3: The Lippitt Morgan Breeder's Association (LMBA). Question 4: What is the name of the old type Morgan horse of pedigree, only traditional colors, bred to type exclusively capable of primary work on small family farms, ranches, homesteads, in the woods or on the roads? Answer 4: The POSM Horse TM. Question 5: Who breeds POSMs? Answer 5: The American POSM Horse Association TM. A small group of folks dedicated to the preservation, promotion and perpetuation of the old type all around use Morgan horse for primary work on small family farms, ranches, homesteads, in the woods and on the roads. Question 6: Why do we need the A POSM HA? Answer 6: For the same reason we need the AMHA to provide lots of horses bred to Justin Morgan's Figure and the LMBA to select and limit those lines for a more pure Morgan, A POSM HA breeds POSMs for a particular type (being and appearance determined by what proved Figure outstanding - capable of doing primary work). Not a style (like fashionable colors). Style is whim. Here today and gone tomorrow. Like a woman's hat or a skirt's hem length or fashion. Figure was bay with black mane, tail and legs and no white. Traditionally we have bred: bay, black, brown and chestnut; stars, coronets, etc. accepted, but to be bred out. Question 7: Do we need POSMs? Answer 7: Yes, we do. Like the old bird hunter said (who used his dogs and they were not just for show), " I want my long paper pedigree hunting dogs to hunt." We preserve and breed for original old type Morgan horses that are bred capable and doing primary work well. Horses are not people. We do not choose people by color. Melanocytes do not cause genetic defects. But, they are markers for: high blood pressure, heart disease, diabetes, etc.. By the time modern Morgan breeders realize the old timers knew what they were doing, we pray it will not be too late. Preserve for primary work the original old type Morgan horse - the POSM Horse.